The biggest concern for any business is to make a profit. This goes for any type and size of business. If the business is not in it to make profits, what good is it for them to be in business? How can a business become profitable? It boils down to two important elements. In order for a company to make money, they have to sell their products. This is where the sales team gets into gear. They provide the product to the customer and close the sale. But how can they do this if no person sees the product. This is where the marketing department comes in. As you can see, both the sales and marketing departments must exist and work together if the company is to make money. There is one problem however. Many companies are going under because there is no unity or alignment, if you will. the wrong buyer, or uses the wrong sales tactics to do the selling. or have made improvements in the way they earn and keep customers. If you look at trends and compare companies, you will notice something of interest. The companies that are doing well know who and where to market their products to. They present their company in the best light possible. The sales department or sales team takes what the marketing team develops, and uses the leads they are given wisely. They focus on what the benefits of their product are, understand what the customer is looking for, and deliver it each and every time. Many fortune 500 companies are like this. They focus on keeping their marketing and sales aligned. the better chance they have to sell their products. 5% faster each year compared to their competitors, who do not have their businesses aligned. and marketing people working in harmony together. state of companies who keep their sales and marketing aligned as compared to those who don't. What do you think is the difference between companies who do great and those who don't? The biggest factor is the way the sales and marketing team work. If the sales and marketing team work together, a lot can get done, which can work in harmony with the company. Each person can work together with another with the goal of accomplishing one task, and that is to gain sales and make profits. which if not corrected quickly, can escalate to the point the company can go bankrupt and close its doors for good. This is why a great strategy for aligning the sales and marketing team has to be in place, for the company to succeed. and examples from both sides - those companies in alignment, and those companies not in alignment. unification within the company is so important for the natural progression of the company. 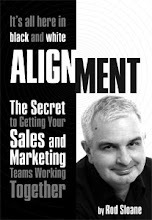 This is an excerpt from my next book "Alignment: How to Get Sales and Marketing Working Together"